Listen to the Cancer.Net Podcast: When the Doctor Says Cancer, adapted from this content. Watch the Cancer.Net Video: When the Doctor Says Cancer, adapted from this content. It is a situation people often fear: sitting in the doctor's office and hearing the word “cancer.” People diagnosed with cancer often say they were stunned when they heard the news and unable to process what was said afterward. After the initial shock, it is important to learn about what comes next. Consider the following steps to learn about your diagnosis, find treatment, and cope. Cancer is a group of more than 100 diseases. It is important to understand the specific type of cancer or cancer-related syndrome you have been diagnosed with. This includes other tests needed as part of the diagnosis process and the treatment options. Take an active role in your cancer care by asking questions and using resources available. This information will help you make informed treatment decisions. During your initial doctor’s visit, you may struggle to process the amount of information you receive. The unfamiliar medical language may confuse you. Ask your doctor to explain any medical terms you don’t understand. And don’t be afraid to ask questions. Consider bringing a family member or friend to your appointments to help listen and take notes. Or record the conversation so you can replay it later. Some patients desire more information, while others prefer less. Tell your health care team your preferences for receiving information about your diagnosis, treatment, and chance of recovery. Ask if there is a learning resource center or other patient education resources available at the place you are receiving treatment. It is important to use good judgment when searching for health information online. Ask yourself these questions as you visit cancer information websites. After receiving a cancer diagnosis, you should find an oncologist. An oncologist is a doctor who specializes in treating cancer. Ask your primary care doctor, family members, and friends for referrals. Or search online to find an oncologist in your area. Also consider getting a second opinion. This involves visiting another doctor to gather more information about your diagnosis, confirm your diagnosis, or hear about a different approach to treatment. Getting a second opinion can boost your confidence in making decisions about your cancer care. Many doctors encourage their patients to seek a second opinion. Ask your doctor what clinical trials are available as a treatment option for you. A clinical trial is a research study to test whether a new treatment is safe, effective, and possibly better than standard treatment. You will need a system to track all of your research, appointments, test results, records, and finances. Organization helps you gain the most value from the time spent with your health care providers so you can make well-informed decisions. If you have a smartphone or tablet, you can download Cancer.Net’s free mobile app to stay organized. It provides cancer information, tracks side effects, and saves prescription information. The app also records answers to your personal questions. You are not alone as you cope with your cancer diagnosis and treatment. Find support from family, friends, and community resources to manage emotional, practical, and financial issues. Emotional support. You may experience complex emotions during your diagnosis and treatment. In addition to talking with your health care team, discuss your concerns with family members and friends. Consider joining a support group to share your experience and learn from others facing similar situations. Counselors can also help you talk about difficult emotions. It is normal for people diagnosed with cancer to worry or feel discouraged. But people who are living with cancer do have a higher than usual risk of becoming depressed. If you feel that you have lost your interest in your usual activities or are struggling to concentrate, sleep, or eat, tell a member of your health care team and ask about counseling options. Writing in a journal (learn about the power of writing). Praying or meditating (read about the role of spirituality in cancer care). Practical support. As you deal with your cancer diagnosis and treatment, you may wonder how you can manage your normal responsibilities, including work and parenting. This is a time to ask for and accept help from others. There are many practical steps you can take to manage stress. Financial support. The cost of cancer care can be high and a burden for some people. Soon after your diagnosis, begin talking openly with your health care team about the costs of your care. Understanding what costs to expect before starting treatment can help you manage cancer’s financial impact. Learn more about managing the cost of cancer care and find helpful financial resources. Finally, although cancer is a serious disease, you have reasons to be hopeful. In the past several decades, major milestones have been reached in the care and treatment of people with cancer, including metastatic cancer. These include advances in treatment and supportive care for side effects. 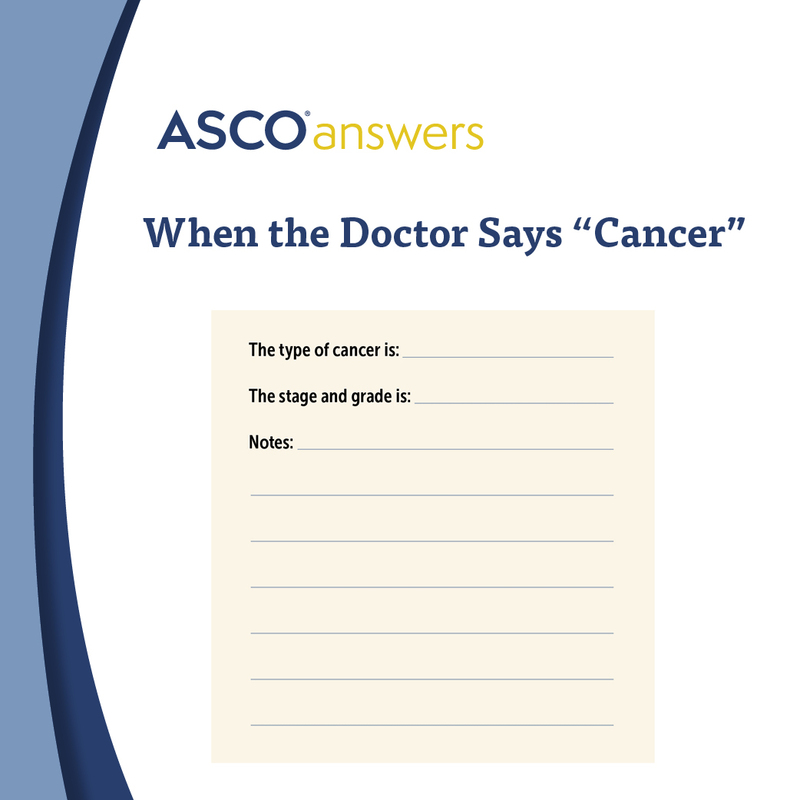 Download When the Doctor Says "Cancer" (PDF), a 1-page (front and back) fact sheet that provides a general introduction to cancer. It includes descriptions of stage, grade, treatment types, ways of coping, words to know, and questions to ask the health care team. Order printed copies from the ASCO University Bookstore.